Call of Duty 2 was the Direman Press 2005 Game of the Year. I bestowed upon it this dubious honor because it was the first true "next-gen" game. Call of Duty 2 was the sole Xbox 360 launch title to deliver on the promises of hi-definition audiovisual glory. It's also the best World War II shooter ever, featuring top-notch, intense gameplay. Developer Infinity Ward just knows how to craft compelling first person shooters (they also made the original Call of Duty and Medal of Honor: Allied Assault, the second and third best World War II shooters ever). PC gamers have been blessed with their products for years, and Call of Duty finally brings that greatness to consoles. The single player mode puts you in the shoes of a Red Army soldier defending Moscow and Stalingrad, a British "Desert Rat" fighting Rommel's Afrika Korps in North Africa, and finally an American Ranger storming Pointe du Hoc on D-Day. Pointe du Hoc was a 100 meter cliff with six 155mm guns overlooking Utah and Omaha Beaches. These guns needed to be neutralized or they would rain death on both landing zones. Even more ridiculous than the order for Army Rangers to scale this escarpment (while under machinegun fire with the tide coming in behind them) and seize these guns defended by an entrenched foe, was the fact that they managed to pull it off. Upon returning to the scene years later, one veteran stared at the sheer rock face and asked, "Can anyone tell me how the hell we did this?" 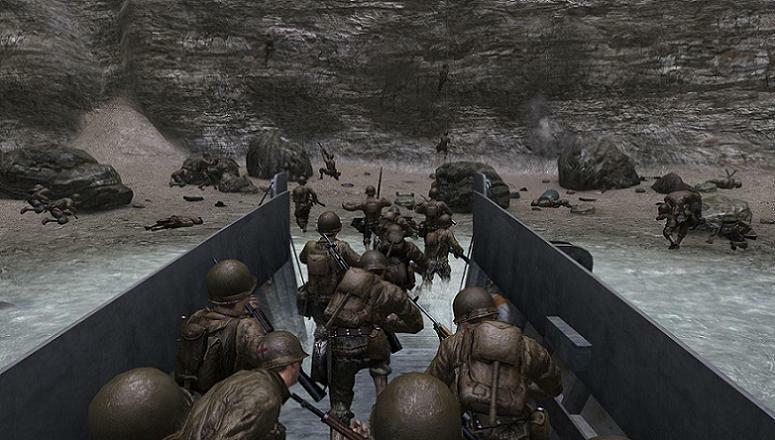 The game recreation of this military feat was one of the high points in the excellent Call of Duty 2. The strength of Call of Duty 2 is the visceral, cinematic, and chaotic density of the action and environments. As the Russian soldier, you're forced to seek refuge in an icy trench, as German Panzer tanks rumble over you. These mechanical monsters shake the earth, and churn heaps of snow from their massive treads. As your British soldier races to assault a desert port city, Allied and German planes dogfight overhead, and swoop down on roaring strafing runs. In addition to providing a variety in locales, Call of Duty 2 also relieves you from FPS fatigue with vehicle sequences, including a mass armor engagement wherein you pit your fast and light British Crusader tank against more powerful German Panzers. The lighting effects are marvelous; there's a sequence scrambling through pipes as Nazi snowtroopers fire at you - real time shafts of dynamic light bust through the smoking bullet holes in the pipes. Snowflakes swirl, dust particles puff, and debris explodes in seemingly true physics randomness. Dozens upon dozens of infantry fire on each other as volumetric smoke grenades waft gently during high explosive tank duels while aircraft scream overhead and artillery plus naval bombardment and...all without a single hitch of slowdown. Call of Duty 2 presents the chaos and sheer ridiculousness of warfare. The surround sound audio is superlative as well, with satisfying weapon discharges and a stirring anthemic soundtrack. The controls are tight and responsive. We're finally reaching a point where we expect these sorts of features in games, but it's amazing to see them fully realized in a first-generation Xbox 360 title. It isn't quite perfect, however. Call of Duty 2 manages this excellent presentation via heavily scripted cinematic set pieces. Otherwise, the game itself shuffles you down a traditional, predetermined corridor gauntlet. Occasionally, you have a tiny bit of freedom in deciding which of multiple objectives to tackle first, but for the most part, Call of Duty 2 is entirely on rails. Particularly on the higher difficulties, the illusion can break down and you find yourself flailing against the vintage game design. The toughest "veteran" difficulty setting involves dying repeatedly, and memorizing how best to deal with enemy soldiers from past failures. "I'll shoot the two guys on the left, toss a grenade into that corner, melee the soldier charging me, duck behind that wall to reload..." You have to be fairly bloody-minded to try dozens of variants of that formula in order to progress. Conversely, the easy difficulty setting allows you to stride about with impunity, leisurely mowing down legions of Huns. I like to pretend I'm the Terminator, sent back in time to ensure an Axis defeat, or that I'm Captain America who's pissed because he lost his shield. There also isn't much of a plot, aside from, you know, World War II, and you don't really connect with any of the characters. There's no particular sense of loss when a fellow soldier dies, as there should be when one of your "Band of Brothers in Arms" is lost. Call of Duty 2 also employs the ever-popular Halo style of regenerating health meter. It doesn't really make any sense in terms of realism, but it is preferable to hunting down the equally unrealistic insta-heal med packs. The draw here is the single player campaign. The online mode is limited to a measly eight players (the PC version definitely has an advantage here at a cap of sixty-four) and while it is decent, it seems like it's there simply because modern FPS games are supposed to have a multiplayer component. Give it a rental if you just want to blow through and see the awesome campaign, but if you're into building a library of landmark software titles, Call of Duty 2 belongs on your shelf.